Hello Fabricistas! It's Meg from Cookin' and Craftin'. I've got some summer-y sews for you today... it's not quite summer yet where I live in Vermont, but I'm definitely dreaming of summer. My summer plans involve basically wearing linen 24/7... a lady who linens, if you will. I have a feeling some of my fellow Fabricistas (Elizabeth and Tiffany) may feel the same way, as they've sewn up some lovely linen projects lately, too! The designer linen from Fabric Mart is just really lovely... such fabulous quality. Nice drape and beautiful texture (hard to photograph in white!). I got my hands on some significant yardage of the white linen this month and was super excited to sew with it! I had originally planned to make shirts for me and Tim, but it turns out that Tim is not a lover of linen as I am. I shrugged my shoulders and thought to myself, "More for me!" In the end, I decided to stick with the two shirts plan, but went with two shirts for me in two very different styles. I made the version with the cut-on button plackets and basic patch pockets. 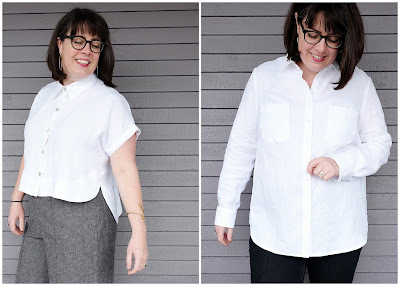 The only changes I made to this size 16D Classic Shirt were to curve them hem a bit on the sides, and to make a full bicep adjustment to the sleeves. I opted for traditional white buttons. I love it! Such a fabulous basic shirt. It's sure to be a wardrobe workhorse! Style 2: For my second shirt, a modern, funky take on the shirt: the cropped version of the Closet Case Patterns Kalle shirt. Again, I've made this shirt a couple of times, but never the cropped version! This is also a size 16, no alterations. I made the version with the regular button placket and opted for some mother of pearl buttons from my stash. I adore that faced hem... so dramatic! And the back pleat is quite elegant. This is definitely a TNT pattern for me! Thanks for the lovely fabric, Fabric Mart! Can't wait to get my hands on more of your designer linen! I LOVE linen. Just placed my first order on fabric mart this week. Great prices. Can't wait to start sewing with it. Aw Meg, you look so fab in this white linen!! Love how different both shirts look and how easily a white shirt can make you wardrobe so much better. Now I must make one. Yes, you read my mind Meg, LOL! 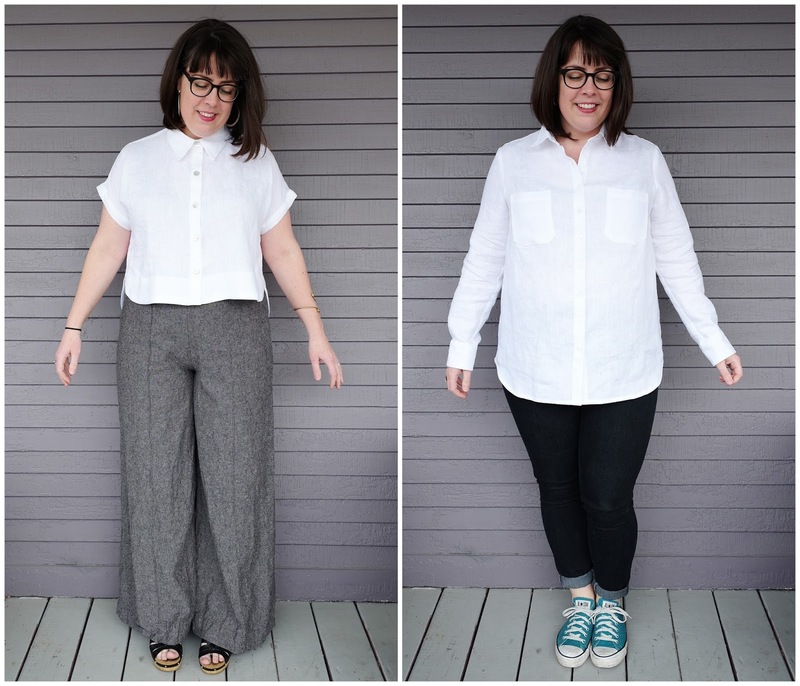 Linen is my middle name in summer followed closely by all the rayon challis! The Kalle is a perfect match for those amazing wide leg pants (are they linen too? ), and the button down looks like such a great way to enjoy linen and not have to wear tons of sunscreen too!